For those of you that don’t know what a Buckeye is, buckeyes are nuts that grow on trees and are related to the horse chestnut.We like to make a dessert that resembles them so we call them Buckeyes! 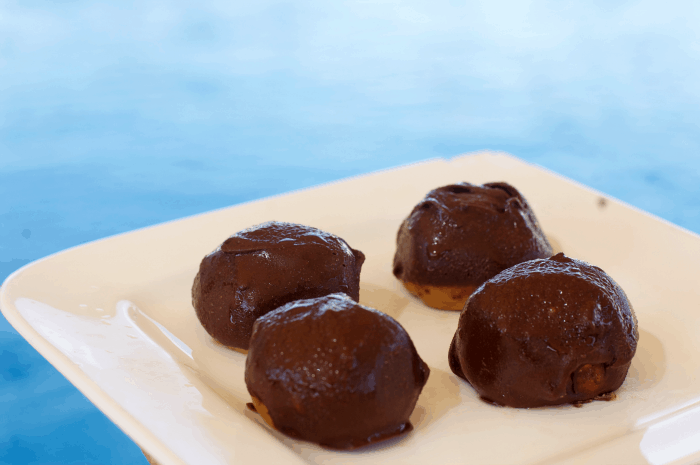 It’s a peanut butter ball dipped in chocolate that are are insanely good. A traditional Buckeye recipe calls for peanut butter, lots of butter, lots of powdered sugar, and shortening to go with the dipping chocolate. I changed the recipe to make it a healthier, but still a delicious treat! 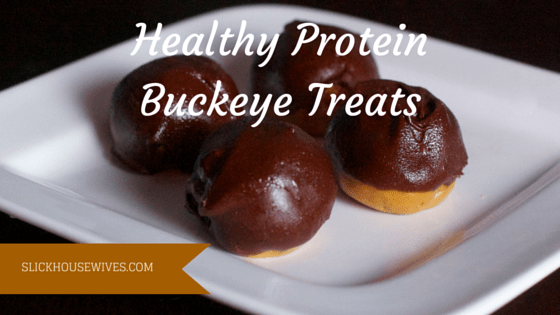 Check out how to make Healthy Protein Buckeye Treats. Combine peanut butter, vanilla, protein powder, and honey in a medium-size bowl. Mix until the texture is like cookie dough. Next, line a baking sheet with parchment paper. Using a 1 tablespoon cookie dough scooper, scoop dough into your hand. Roll into a ball and place on paper. Repeat. Place baking sheet in freezer for about 30 minutes, or long enough for the balls to settle and firm up a bit. While your peanut butter centers are chilling, Place 1 cup chocolate chips in a small bowl. You want it to be big enough to fit the chocolate chips, but small enough so you can dip the peanut butter centers. Microwave for about 60 seconds. Then, add in coconut oil and mix. Once the peanut butter centers have firmed up, it’s time to dip and place on a cookie drying rack to prevent any rings from forming. Place a ball on the end of a fork. Dip ball into chocolate, leaving a ring at the tip. Hold your fork with your left and and use your right hand to tap your wrist, so that any extra chocolate drips off. Finally, use a toothpick to slide the ball off the fork onto your drying rack. Repeat. Place cookie rack into the freezer to speed up the drying process. Storage: will stay good in your freezer for up to 1 month. *Best eaten frozen! 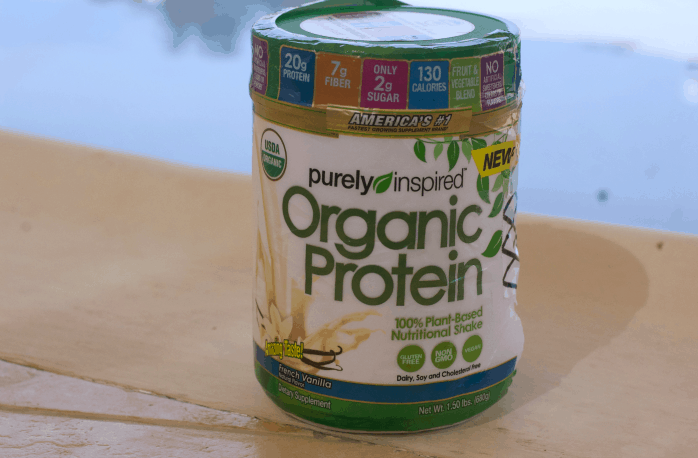 I was intrigued by Purely Inspired because it is 100% plant based without artificial colors and flavors. I obviously take in to account the price and at only $19.97 it’s a great price compared to your standard whey protein powder, and it is the only truly organic USDA-approved (vegan) plant-based protein powder. You can use it in smoothies, shakes, brownies and muffins. If you are in a hurry be sure to check out Mission1™ bars! These are the way to go. I like to grab one when I’m in a rush in the morning. It is an easy way to add protein to my diet and they keep me full! New at Walmart, these options are affordable, great-tasting, and free of harmful fillers and chemicals! If you are trying to eat healthier, be sure to check out our Easy Baked Meatballs Recipe! I'm not sure if it's just me but I can't access any other recipe than the macaron recipe. this page isn't showing anything but the title of the recipe. I'm not sure. Try refreshing and looking at the page again.